A simple burger is no good when you're marvin for some real snacky satisfaction. 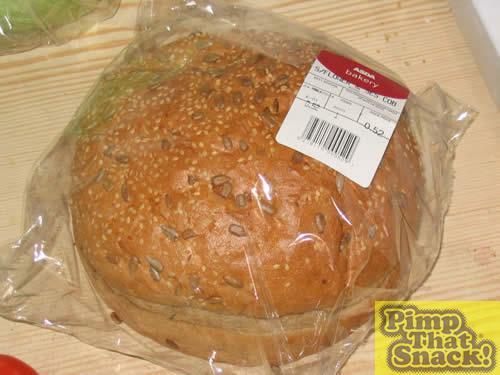 A chance meeting with a round loaf in Asda, a flash of inspiration that it looked *really* like a burger bun (only in brown bread, which is obviously healthy and cancels the lard factor) and bada bing... the burgerperfect was born. A 6x scaled version of the quarter pounder. The 'burger bun' that inspired it all. Firstly, we listed the things a good burger must have (basing it loosely on Burger King's 'bacon double cheese' but adding vegetation again, in a lard-cancelling capability). Onion rings were pondered, but we forgot to buy them. Behold - the raw ingredients! Sadly, the mayo and relish didn't make it into the shot, and we have some spurious finger rolls and olive oil. Actually, the olive oil was used to fry the burger, so ok, it can stay in. The burger was basically 703g of Asda's finest lean beef steak mince, combined with an egg and stirred up, then moulded lovingly into the biggest beef patty I had ever had the joy of making. It was a bit sloopy but this was solved by coating it in flour (not pictured) before frying. The monster.... nearly 3/4 of a kilo of MEAT. Oh yeah. It took about 20 minutes to fry, and turning it required manual dexterity and two spatulas. 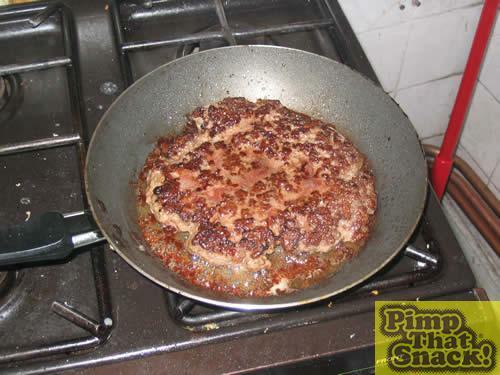 The next step was to prepare the peripherals so that the burger would have somewhere to go when it got out of the pan. The loaf was cut into three so as to facilitate the maximum cheese melting area. We contemplated having two thin burgers, but figured one thick one would be simpler (oh lazy, lazy us). 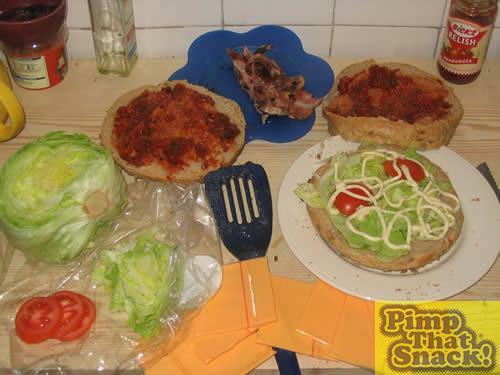 All layers were spread copiously with Bick's burger relish, then the bottom layer was padded out with iceberg lettuce, a few slices of tomato (which looked really pitiful - we should have used one of those beef tomato things they fry up at greasy spoons) and a liberal lacing of mayo. This was to be the 'bed' for the burger. 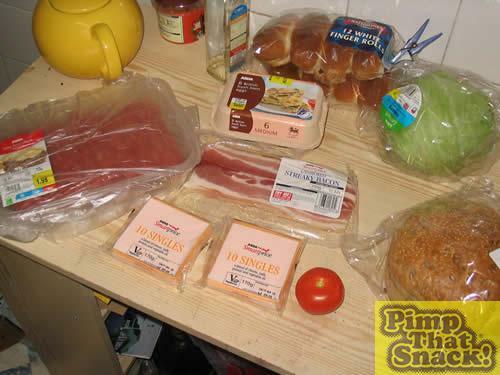 The bacon was fried to within an inch of its life, and the cheese slices were released from their packaging. More salady-goodness was prepared for the upper layer, but not installed because it would have slipped off when layering the burger.